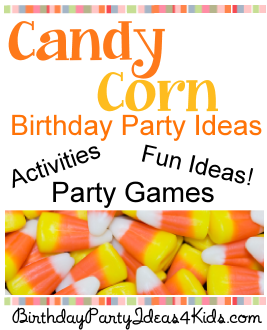 New for the Fall / Autumn season we’ve added the Birthday party theme – Candy Corn! Fun and festive and great for a kids, tween and teen birthday party theme. You’ll find candy corn theme party games, activities, scavenger hunt and ideas for invitations, decorations and party favors! The perfect place to find ideas for your Fall themed party – Birthday Party Ideas 4 Kids . Let us help you get the party started!